Afrobarometer survey shows Namibia's economic condition. 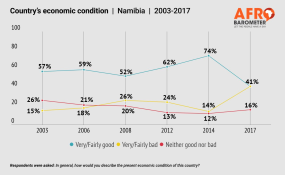 According to the most recent Afrobarometer survey, the share of Namibians who think the economy is doing poorly is at a historic high, while almost two-thirds said the government is doing a bad job of managing the economy. The survey which was released this week said the share of Namibians who rate the country's economic condition as 'fairly good' or 'very good' has dropped from 74% in 2014 to 41%. Yet more than half describe their personal living conditions as good, and a majority expect things to get better over the coming year. The Afrobarometer team in Namibia, led by the Institute for Public Policy Research (IPPR), interviewed 1,200 adult Namibians between 5 and 27 November 2017. A sample of this size yields country-level results with a margin of error of +/-3% at a 95% confidence level. "Even though youth tend to rate their own living conditions more favourably than their older counterparts, they are particularly critical of the government's economic management. They are also more likely than their elders to be thinking about moving to another country. Economic considerations feature heavily in these thoughts; by far the most common reason for considering emigration is to find work," the survey stated. Among those who have considered leaving for another country, 6% said they are making concrete preparation to leave, such as getting a visa, while 26% say they are planning to move within the next year or two but are not yet making specific preparations. The survey further indicated that the youth is somewhat more likely than their elders to see their living conditions as good (55% vs. 48%), but they are less likely to approve of the government's performance on the economy (31% vs. 40%). Furthermore, the survey observations show that in the past two years, Namibia's economy has struggled. According to the Namibia Statistics Agency (NSA), In 2016, the country saw two consecutive quarters of negative gross domestic product (GDP) growth, officially plunging it into a depression, followed by the first year since 1993 to record a decline in the GDP, by 0.8% in 2017. At the same time, the NSA showed that unemployment among the youth, who make up almost 40% of the population, increased to 43.4% in 2016, up from 39.2% in 2014.